It is clear that only purely reading calls for purely analytical applications shall be enabled to read from the secondary SAP HANA node (whose data may have a delay of typically 1- 15 seconds). The client tells the backend (explicitly or implicitly, come to this later) if it accepts data that is slightly outdated. 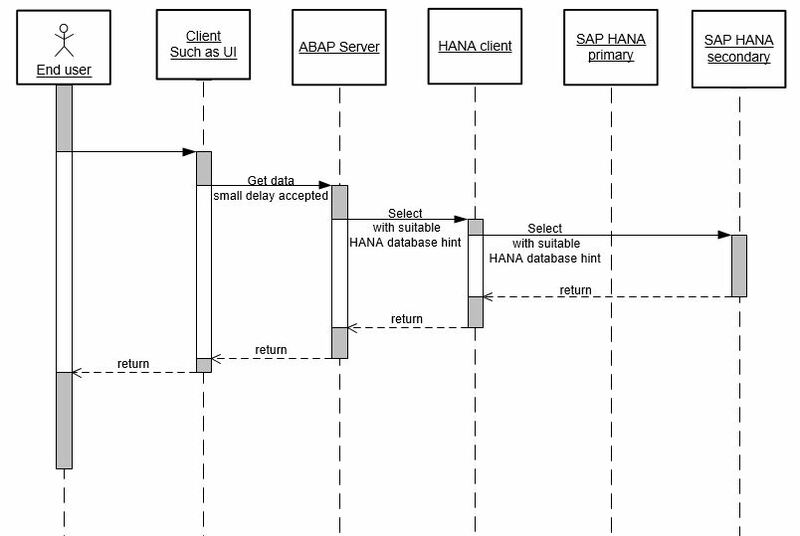 The ABAP server gets this information by the client at runtime and converts it into database hints for SAP HANA. The SAP HANA client decides based on the database hints to which SAP HANA node (primary or secondary) the statement is routed. The respective SAP HANA node answers the request and may return not only the result set, but also metadata about the data age. The result set and the information about the data age is returned to the client and can be displayed there. In the next chapters, I plan to give more details on the E2E process, helping you to understand and analyze in your landscape why and where your calls are routed. Great article. But I still don’t understand how the routing actually work. But how HANA Client know there is a secondary node and it’s host/IP address ? Should we put the second host/IP into hdbuserstore entry ? or the client first ask primary node and then being “Redirect” (w/ 2nd node info) to the 2nd node ? or primary node delegate the request to 2nd node and return result to client ? In addition, should HANA client (or usually the application server) be able to access both primary and secondary individually as well as the VIP ? The hint based statement routing described above works with prepared statements. The HANA client connects to the primary system. The primary system sends the host information about the Active/Active configuration to the client. The client first sends the new statement to the primary system. The primary checks if the statement with hint can be routed to the secondary system. If so, the primary returns the information about the routable statement to the client. The client than sends the statement to the secondary system. The secondary prepares and executes the statement if the visibility delay is fine. The client caches the statements and the routing information. Following executions of the routable statements go directly to the secondary system. The extra-hop to the primary is required only once. So, the HANA client needs to be able to access both, the primary and secondary. Since, the server sends the host information, you don’t need to put the secondary host information into the hdbuserstore. Typically customers use a VIP for the primary a VIP for the secondary system. The VIP assignment change in case of a role switch; i.e. the primary VIP always references the primary and the secondary VIP always references the secondary. You can find further information about hint based statement routing and direct connections to the secondary in the HANA documentation: Client Support for Active/Active (Read Enabled).